With tickets for Ultra Music Festival 2016 now ON SALE, the official aftermovie for the historic 2015 edition has finally arrived. Created by UMF Films and Charly Friedrichs’ FINAL KID team, this latest offering – shot in eye-watering 4K – is yet another remarkable departure from the standard aftermovie format, capturing the pure essence and magic of Ultra Music Festival’s seventeenth annual edition at Bayfront Park in March of this year. Immersing fans deeper into the action than ever before and providing the viewer with the most honest insight into the Ultra Music Festival experience to date, Charly’s work is wholly representative of ULTRA’s musical evolution and demonstrates precisely what fans can expect, come March 2016. With an electrifying new soundtrack offering something different to the classic main stage sound, Charly’s unique vision for this aftermovie takes listeners on a diverse musical journey and into unchartered waters. Showcasing the vast range of genres and styles now on offer at ULTRA, the aftermovie’s exquisitely crafted tracklist really does deliver something special for everybody. From the deeper grooves of HI-LO and Josh Philips, to the high-octane sounds of Skrillex and Valentino Khan, the 14-minute masterpiece concludes with a brand new exclusive from ULTRA favourite and man-of-the-moment, Martin Garrix. “When I planned on shooting this Miami aftermovie I knew I wanted to create a megamix again. The last Miami aftermovie was created as a short film with one custom soundtrack and a lot of story and slow-motion shots in it, but this time I felt like doing a faster one with a lot of new techniques, visual FX and editing tricks. Most of all I wanted to ‘bring back the groove’ so I created a soundtrack that has more flow. I want the viewer to be more ‘inside’ the festival, where people are dancing and not necessarily focused on the DJ. Visually stunning in every sense, the 2015 aftermovie for The World’s Premiere Electronic Music Festival also sees the debut of ULTRA’s brand new RESISTANCE concept. Taking the form of an immersive 360° ‘Afterburner’ stage powered by Arcadia Spectacular, welcoming some of the biggest names in the house and techno world, this piece of audio-visual genius takes us right to the front row of the RESISTANCE Stage to showcase a completely different facet of Ultra Music Festival. As Ultra Worldwide’s 2015 global journey comes to a close, with a staggering 19 shows across 5 continents clocked in less than a year, all eyes are now focused on the eighteenth annual edition of the Miami flagship in March 2016. 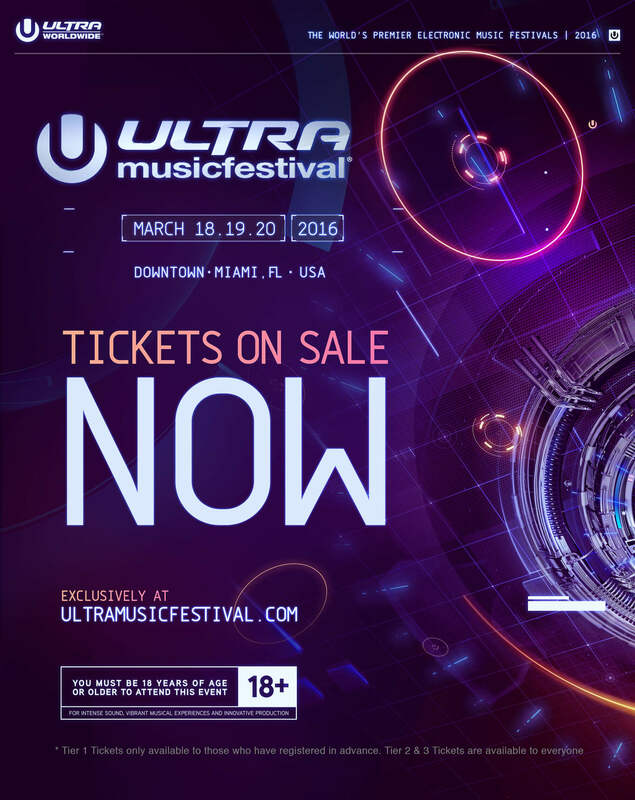 For those that want to experience the action first hand, tickets for Ultra Music Festival 2016 are now on sale. Those who registered in advance will have received exclusive access to Tier 1 ($299.95) ticket pricing, available while inventory lasts. Full prices and details are outlined below.